Mohsen Rezaee, Secretary of Iran’s Expediency Council, Monday mocked the United Arab Emirates, which has criticized Iran’s influence in the region, describing the conglomerate of Emirates as “a paper tower”. The United Arab Emirates (UAE) is “a paper tower that can collapse without even missiles,” Rezaee Twitted. 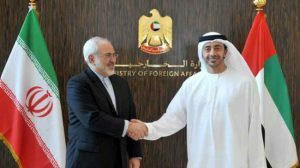 UAE, a faithful ally of Saudi Arabia, has become very critical of Iran recently over Tehran’s influence in Yemen and Syria. UAE’s foreign minister Abdullah Bin Zayed last month accused Iran and Turkey of playing a colonial role in Syria in reference to Tehran’s endorsement of embattled Bashar al Assad and Ankara’s support for Islamic forces opposed to Saudi Arabia and the UAE. The UAE has also blamed Iran for hampering peace in Yemen because of its support for the Houthi rebels, opposed to Saudi Arabia-backed Yemeni President Mansour. Posted by KanelkaTagba on Sep 5 2017. Filed under Gulf News, Headlines. You can follow any responses to this entry through the RSS 2.0. Both comments and pings are currently closed.